Joy is a cornerstone of how kids learn to thrive, so we set out to make a list of books that could help us nurture it. 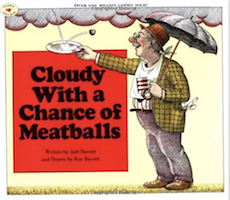 As we culled through bookshelves and memories, the list of books we associate with joy just kept growing, including books that we carry with us from childhood and others for which we’ve fallen head over heels as parents or teachers. For this team, books and joy go hand in hand. So, we decided to narrow our focus to list twelve books that, for us, go one step further—they not only spark joy for us but that have helped teach us and our kiddos how to find joy long after we’d closed their covers. We hope these books help you inspire the joy hunters you love most too! This incredibly touching book just might be the perfect primer for joy hunting. It reminds us that we each have our own, joyful stories made up of the marvelous things we notice each day. Best of all, the book celebrates both the grand wonders we can only imagine and the wonders that hide right in front of us. Read and reread this book with your kids. As it grows familiar, follow it up by sharing what you noticed today. If you’re like us, you’ll start to get even better at hunting for joy as a result! Joy is something we experience in the present moment, and Now is a perfect way to attune your minds to that. Read it before you head outdoors, or bring it with you, and it will inspire you to find your favorite sources of joy—because they are the ones right in front of you, right now. The Indian festival of Holi is celebrated with tremendous joy and happiness, and is centered around both color and close connection with community. This delightful book shares the essence of this beautiful and most joyful holiday with its readers, and has inspired us to be even more playful with color too! 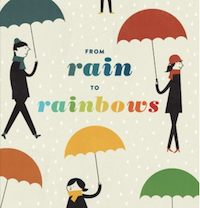 These captivating illustrations come along with a simple message that all weather—the rain just as much as the rainbows—can bring us joy. What a gift to a young joy hunter! Captivate your preschooler or school-aged child with a story of Chewandswallow, the implausibly perfect and playful tale of a town where food falls from the sky—that is joy-inspiring whimsy that kids eat right up. Then, grab an umbrella, some string and balls, and make it rain a feast in your outdoor space! [DIY Activity]. One of our all-time favorites, this book incorporates the joy of color, shape and texture with the power of imaginative play. 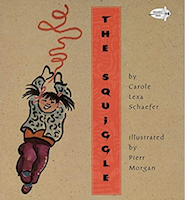 Read this beautiful story, then take a few yards of ribbon and enjoy the endless, joy-inspiring possibility you can find in a squiggle or two of your own [DIY Activity]. This classic celebration of color and animals sparks joy for all generations. 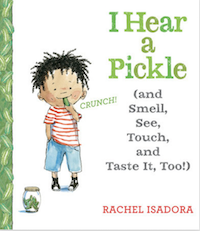 The repetitive, soothing language also captivates young children. If you can get the “slide and find” version, it’s even more exciting to hide and reveal each of the beloved creatures. 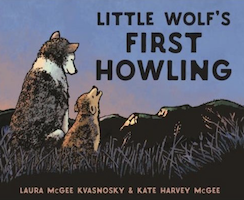 The main messages of this truly beautiful story are: be the leader of your own play; and celebrate “joy and wildness.” Allow this book to be an invitation to howl, each in your own, unique way. It’s an invitation kids (and you) will LOVE! [Read more about how this book came to be]. This one made our list because it elevates the time we spend as a family and how our everyday rituals and routines become trusted triggers for tremendous joy. Enjoy reading this, then list and double down on your favorite day-to-day or week-to-week family rituals.